As Dr. King said, the resolution to this debate must be that we judge people based upon the content of their character, rather than their race, religion, national origin, or financial means. CLP: an editorial that suggests that MLK would have spoken out. CLP: from 2017. Great for connecting to MLK; good quotes, too. What is DACA? 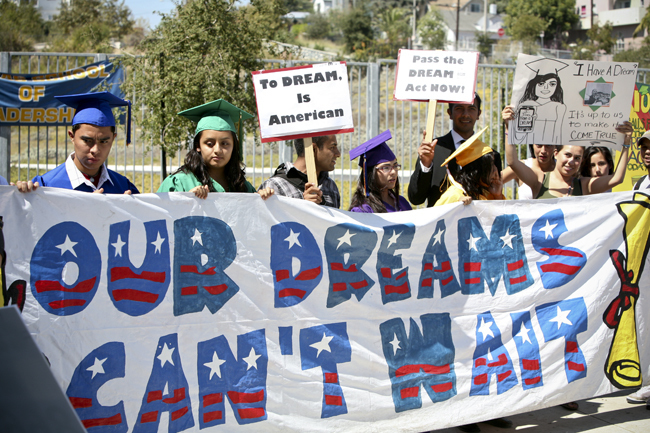 Why was Deferred Action for Childhood Arrival initiated? What are the requirements to be part of DACA? Why was DACA an executive order rather than a legislative decision? Which branch of government will decide on the status of Dreamers? Where does the responsibility lie to decide on immigration questions? How are all three branches involved in immigration decision-making? What is a “Dreamer”? How many Dreamers are there in the United States? What do we know about their contributions? 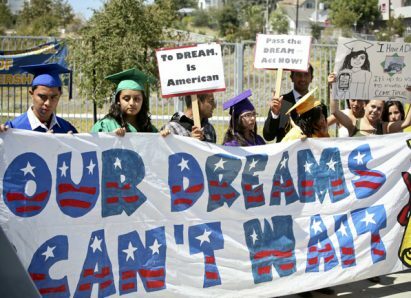 What might be the connection between Martin Luther King’s “I have a dream” speech and the current Dreamers? Can DACA be separated from immigration decisions for all undocumented persons? What is a path to citizenship? What is amnesty? Are immigration and security decisions indivisible? Why? How? What is the history of immigration in the United States? What are the factors in deciding about immigration in 2018? What is the legal basis for the lawsuit against the Trump administration by some Dreamers? What is the government’s decision regarding Salvadoran immigrants? What does this mean for all immigrants? Is immigration a partisan issue? Is immigration a constitutional issue? Is immigration policy a mirror for the soul of democracy? Does US immigration policy affect our relations with the rest of the world? What is the future of immigration legislation? What is the future of DACA? CLP: Official White House statement. Focus on security and enforcement. CLP: Not DACA but El Salvadoran Temporary Protected Status is related. From a pro-immigration site. CLP: helpful info from trusted source. CLP: Emphasis on know your rights and activism. 8.20 Analyze the changing definition of citizenship and the expansion of rights. 8.21 Analyze important political and ethical values such as freedom, democracy, equality, and justice embodied in documents such as the Declaration of Independence, the United Sates Constitution, and Bill of Rights..
HS.5 Examine and evaluate the origins of fundamental political debates and how conflict, compromise, and cooperation have shaped national unity and diversity in world, U.S., and Oregon history. HS.6 Analyze ideas critical to the understanding of history, including, but not limited to: populism, progressivism, isolationism, imperialism, communism, environmentalism, liberalism, fundamentalism, racism, ageism, classism, conservationism, cultural diversity, feminism, and sustainablity. HS.17 Explain how migration, immigration and communication (cultural exchange, convergence and divergence) lead to cultural changes and make predictions and draw conclusions about the global impact of cultural diffusion. HS.18 Analyze the impact of human migration on physical and human systems (e.g., urbanization, immigration, urban to rural). HS.27 Examine functions an process of United Sates government. HS.35 Examine the pluralistic realities of society (e.g., race, poverty, gender, and age), recognizing issues of equality, and evaluating need for change. Unit 4, Lesson 23: What is the role of the President in the American constitutional system?